It's the year 3797, and botanist Nika Temsmith is researching a strange species on a remote science station near the outermost rim of colonized space. It's the year 1921, and renowned English explorer William Pike leads an expedition into the dense jungles of Peru in search of the fabled "Lost Temple of the Incas," an elusive sanctuary said to have strange healing properties. Two disparate souls separated by thousands of years and hundreds of millions of miles. Yet they will fall in love and, as a result, bring about the end of the universe. Even though reality is unraveling all around them, nothing can pull them apart. This isn't just a love story; It's the LAST love story ever told. 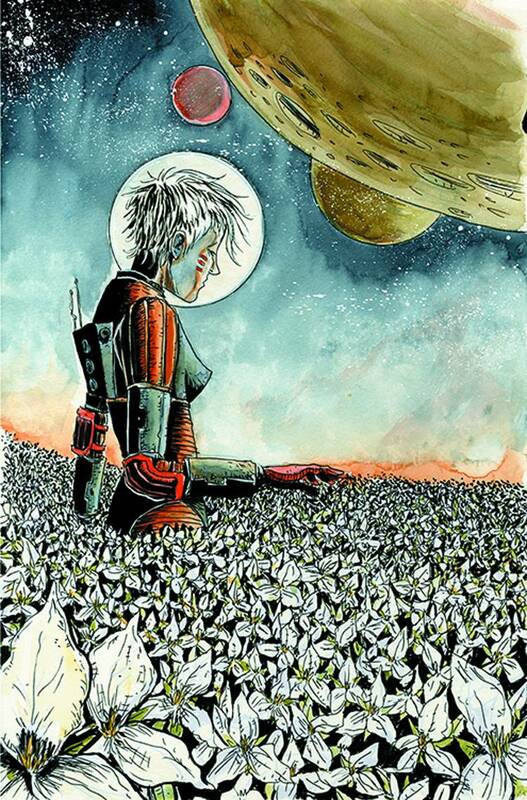 Trillium is an 8-issue series that combines rich historical adventure and mind-bending science fiction into a sprawling, unconventional love story by Jeff Lemire (SWEET TOOTH, CONSTANTINE, ANIMAL MAN). This amazing miniseries kicks off with 28-pages of story in a flip-book with two covers and two separate but connected stories!